Back in early 1974, Southwest Airlines had finally cleared an annual profit, but remained relatively unknown outside of Texas. We were still only flying to our original three cities with three airplanes, but it didn’t go completely unnoticed. 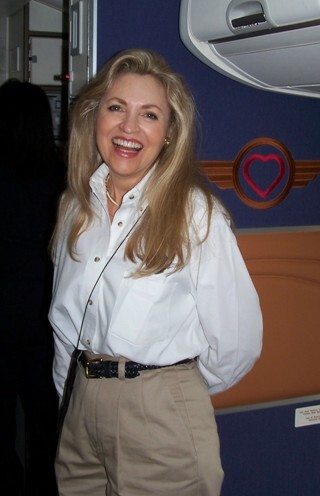 Forty years ago this month, Southwest entered the national media spotlight when one of our original 1971 Flight Attendants, Sandra Force, graced the cover of Esquire Magazine in what has become one of the most iconic images in our Company’s history. While the February 1974 cover now appears in countless locations around the system, it took quite some time for everyone to appreciate it—especially Sandra. 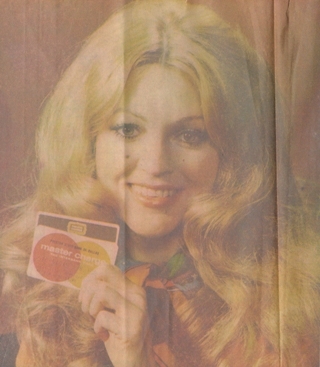 Sandra in a 1972 MasterCard ad. After graduating from Mississippi College in 1968 with a degree in art and education, Sandra moved to Dallas to teach fourth and fifth graders at a local elementary school. She had also been crowned Miss Tennessee in 1968 and was a Miss USA finalist as well. During the summer of 1971, she heard about the new Southwest Airlines from a friend and was excited about the opportunity to only work a half day on Saturdays and be off on Sundays. Following a call to the airline about becoming a Hostess, she interviewed and was hired the same day on September 20. With her glowing personality and matching good looks, she quickly became one of the most recognizable Employees in our print ads. A name was certainly being made for Southwest throughout the Lone Star state. However, it was surprising to everyone when the national publication Esquire called in late 1973 about featuring the Company in its upcoming “Best of America” edition. The magazine was to showcase things such as the best ginger ale, the best bar snacks, and the best stewardesses. After all, the publication did strive “to become the common denominator of masculine interests—to be all things to all men.” The decision was made to come down to Dallas and photograph four Hostesses standing on the wing of one of our aircraft. But when the photographers returned to their office in New York, one person in their photos captured their attention. Sandra received a phone call from Camille Keith, our Vice President of Special Marketing, sharing the news that Esquire wanted her to come to their studio in New York for additional photos. Her initial reaction was she couldn’t as she was busy flying, but Camille reassured her that the trips could be taken care of and that she would receive $25.00 in special assignment pay. Once arriving in New York, Sandra was “treated like royalty,” dining at the Russian Tea Room and being provided a chauffeur and makeup artist. After the photo shoot was completed, Sandra returned to Dallas reflecting back on how wonderful the experience was, until she saw the finished product on newsstands several weeks later. Unbeknownst to Sandra, the editors of the magazine had taken several creative liberties by airbrushing several parts of her body. She was devastated, and immediately called her mother just in case she saw the image. Her mother's first question was, “Did you have your clothes on?” As a graduate of a Christian college, she was very concerned with how others would perceive the photo. The next person she spoke to was Lamar Muse, our President at the time, whom she begged to intervene. To the contrary, Lamar responded, “You really don’t think I’m going to stop a national magazine?” He couldn’t have been happier with the cover and the positive publicity it brought to Southwest throughout the United States. For many years after the magazine cover, Sandra’s opinion didn’t change. She continued to feel deceived by the enhancements made without her approval, but she has since looked back on it and come to appreciate the legacy it helped her create for Southwest. She remains a dedicated Employee to this day and is one of five original 1971 Flight Attendants still active with the Company. However, if you’re looking for Sandra on your next flight, don’t expect to see someone who continues to work beyond an age when many decide to retire. With both a youthful appearance and wonderful attitude, Sandra plans to provide Positively Outrageous Customer Service for many years to come. People of Size don't matter where else is Southwest cutting corners?